Enhance your Hookah smoking experience with the stylish Chinese Extra Large Porcelain Hookah Bowl. 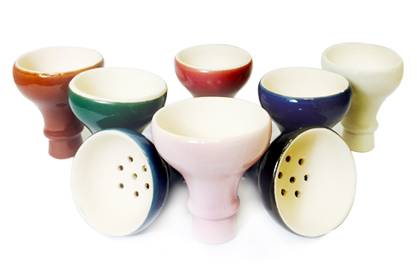 With many different colors to choose from, we're sure to have the specific bowl that will match your Hookah. The Chinese Extra Large Porcelain Hookah Bowls are very durable and are made to work with most style Hookah models in the industry. This bowl is inspired by traditional Egyptian style bowls that have been used in hookah for centuries. The ability to hold heat with this bowl is perfect for smoking your favorite shisha without fear of burning it. The Chinese Extra Large Porcelain Hookah Bowl is an amazing bowl option for any level of hookah enthusiast. The Chinese Extra Large Porcelain Bowl is a larger version of our Porcelain Bowl and can hold approximately 35 grams of Flavored Tobacco. Grommet Compatibility This Hookah Bowl typically requires using an Egyptian Rubber Bowl Grommet to connect this Hookah Bowl to the top of the Hookah stem. Click Here to view the Egyptian Rubber Bowl Grommet.